I have two new characters to introduce you to Toby and Tina Bear. They have been made for the Lincolnshire Police as they hand bears out to children who been in traumatic situations. 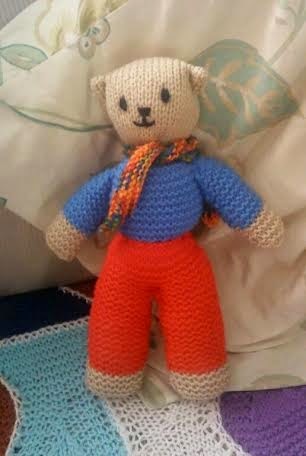 He was knitted using the pattern for Teddies for Tragedies I gave him a waist as it helps small hands to grasp him easier. His scarf is sewn on at the back so it can not be lost. She is what they call an Angel bear and very different from any bear I have ever knitted. 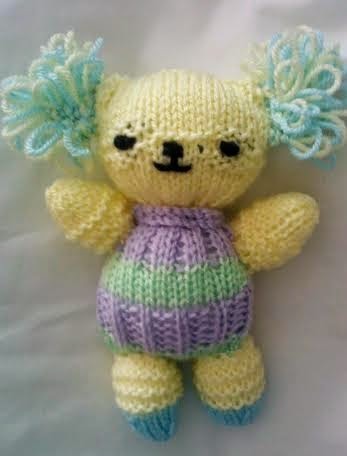 You can find the pattern for these bears in the link below. This is an old post from November 2013 but I contacted the Police and they still accept bears but not putting out a public notice for them. I have never done the Loop stitch before so had to find out how to do it. There seems to be many different ways to accomplish this stitch and I found one that was easiest for me to do. So there are two more characters looking for someone to love them and one day I am sure they will be introduced to someone who will love them. I always name my bears or any toy I make as I think a toy without a name is sad, yes I know it may be strange for a grown woman to name the toys but I am still a child at heart. I am pleased the Loop stitch link helped. Like you I no idea how to do it but now we both have mastered something new.